BRP continues to push the water sports world with the only tow specific watercraft with the 2013 Sea-Doo WAKE models. The Sea-Doo WAKE models are the most versatile and performance driven watercraft, even when the tow rope is stowed. For 2013, the Sea-Doo WAKE models continue to be the official watercraft of the world class NIKE wakeskate team riders Nick Taylor, Ben Horan and Kevin Henshaw. 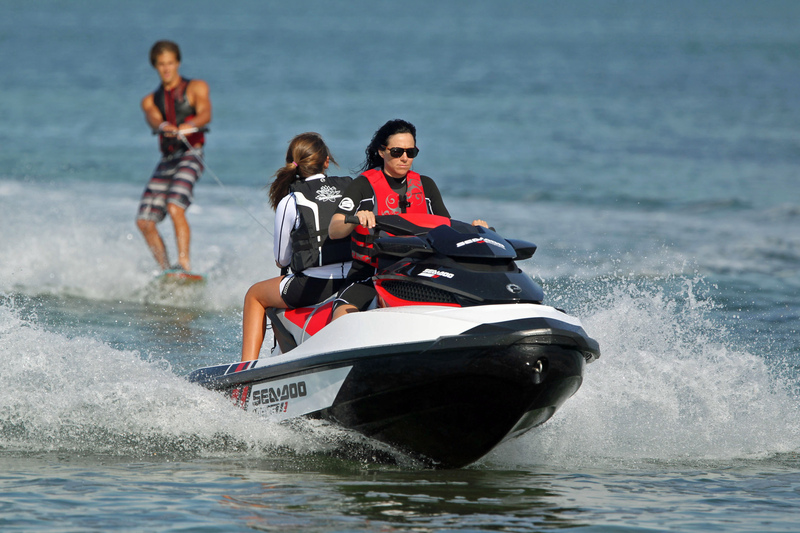 BRP’s Sea-Doo WAKE watercraft offer unmatched versatility by providing a first class pull and exhilarating ride perfect for both beginner and professional boarders. Learning to ride behind an iControl technologies-equipped Sea-Doo watercraft is easier, less intimidating, and more economical than behind a traditional powerboat. Both WAKE models are available with the exclusive Intelligent Throttle Control (iTC) and are calibrated using the exclusive GPS-based Ski Mode to fit wakeboarders’ and wakeskaters’ needs. This exclusive feature is engineered to make every driver an expert with the ability to program the acceleration curve and target speed for a consistent, perfect pull every time. The WAKE 155 is built on the award-winning GTI platform that offers a playful, yet predictable ride on a smaller hull. The WAKE PRO 215 offers more power, pro caliber tracking and comfort from the longer and deeper S3 hull. Both WAKE models are equipped with Intelligent Brake & Reverse (iBR) for an additional level of maneuverability and always start in neutral for ease of loading and unloading at the dock. 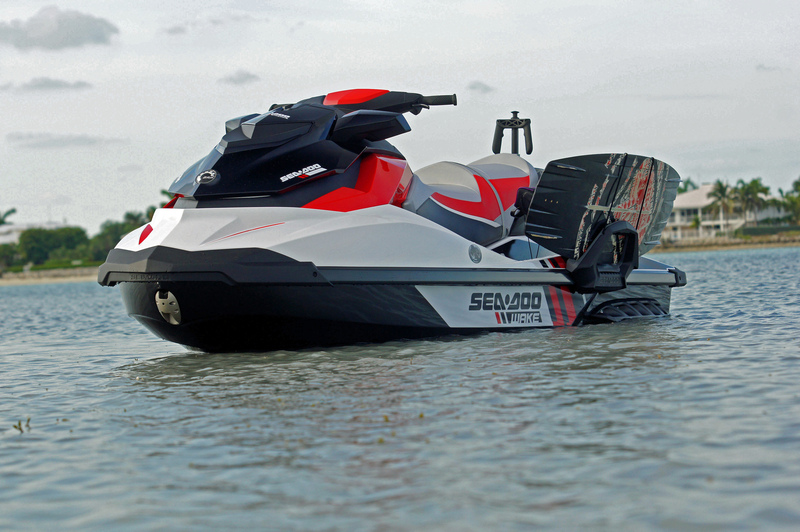 BRP continues to push watersports technology and versatility with the Sea-Doo WAKE 155 watercraft. This model includes iControl, ECO mode and Ski mode to offer the most striking and accessible tow specific watercraft on the marine market. It delivers ample low-end torque to provide a powerful pull with minimal fuel consumption. It features class leading comfort and storage with 116.6 litres (30.8 US gallons) of usable space, plus the addition of iBR and iTC systems. The WAKE 155 is equipped with the PWC industry’s only tow specific package including; Ski mode, retractable tow ski pylon, large swim platform with a fold-down reboarding step, removable board racks and mirrors. BRP’s 2013 Sea-Doo WAKE PRO 215 combines industry leading design with the best PWC tow specific components and performance on a larger platform,making it the ultimate towing watercraft. Based on the S3 hull with a deeper V, the WAKE PRO 215 offers solid straight-line tracking during rider edging and greater comfort during extended treks over open water. It comes standard with the award-winning ECO Mode and a GPS calibrated Ski Mode. The iControl equipped WAKE PRO 215 watercraft comes with iBR which enables quicker turnarounds for rider pick-ups. Additional features include retractable ski pylon with spotter handgrips, removable board rack, fold-down reboarding step, tilt steering, high performance VTS and watertight removable storage bin. Nike wake team riders, Ben Horan, Andrew Pastura, Nick Taylor, Kevin Henshaw and Silas Thurman, utilize BRP’s Sea-Doo WAKE watercraft exclusively. They have a combined 1,750 hours of use among their respective watercraft. These riders share trick tips and their insights behind the WAKE PRO 215 and Wake 155 models in the Nike “DO IT” wake video shorts that can be seen in the Wake section on Sea-Doo.com, youtube.com/seadootv, remotewakeskates.com, and nike6.com. It is really cool what these guys can do on the Nike videos. I imagine it takes lots of practice and falling in to get this good. Yes, it takes hours and hours of practice to develop these skills!